The new finite formula for partition numbers is revealed beginning at 0:25:00 in the video. The explanation of how partition numbers are fractal begins at about 0:47:00. Mathematician Ken Ono recently presented new breakthroughs in number theory that were centuries in the making. In the above video, you can watch Ono explain the first finite formula to calculate any partition number, and the discovery that partition numbers behave like fractals. Ono gave the special hour-long lecture for a general audience at Emory on Jan. 21. Although the talk begins with the Count from Sesame Street, it quickly escalates to complex formulas, demonstrating why the simplest problems to state in number theory can be the hardest to solve. How do you count a number’s partitions, or the sequences of positive integers that add up to that number? It sounds easy, until you realize that the number 100 has more than 190,000,000 partitions. If you were to try to write down all the partitions of the number 200, then add up how many there were, you would never finish. It would take you several lifetimes, and you probably wouldn’t arrive at the correct answer anyway. 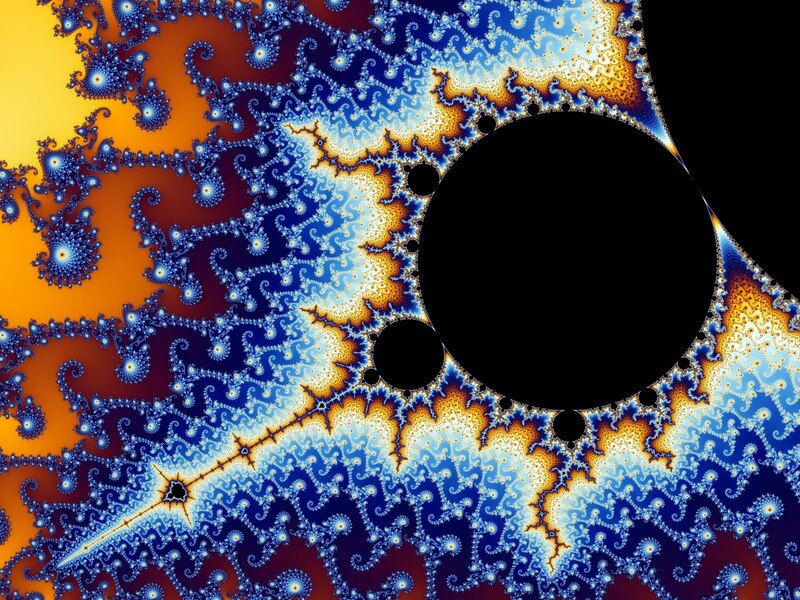 The Mandelbrot set, above, is the most famous fractal of them all, and demonstrates the endlessly repeating patterns of forms in nature. Ono and his colleagues discovered a new class of fractals, one that reveals the endlessly repeating superstructure of partition numbers. Credit: Wikipedia Commons/Wolfgang Beyer. Ono led a team of researchers to make the recent breakthroughs, including Jan Bruinier of the Technical University of Darmstadt, Amanda Folsom of Yale and Zach Kent of Emory. Their work was funded by the American Institute of Mathematics and the National Science Foundation. Fantastic news. Confirms the fractal basis of magnitude. Time to put the number line in it's proper context, only part of the dynamic magnitudes we use and create to measure. This discovery has enormous implications for practically all fields of science. Most people cannot even begin to realize how huge this is. We are here possibly witnessing a crucial point in the history of science comparable to Einstein's work. Ken Ono and Benoit Mandelbrot are pioneers leading us into a new era of knowledge about everything and the universe. Even the old question of life can be answered with it. I'll give you a start: Encryption using QuantumComputers can be broken with it and you can plan entire cities mathematically. Every mechanical device can be optimized in efficiency while use even less material, energy and cost for production. Aerodynamic behaviour, Flow of Liquid materials and expansion of chemicals inside liquid can be predicted with immense precision and much less computation. Human behaviour and language can be understood better and improved by enviromental applications, because of their fractal nature. Especially Computer Science problems will benefit a lot from this discovery which will be THE CATALYST for so many new discoveries.